In the first week of introductory geology, we explored rock types, learned that not all rocks are the same, and tackled the mysteries of scale. While not always elegantly executed, my experiment in embracing active learning appears to be leaving my students excited and bemused. I don't care how long I've gone to school, or how many lectures I've given or classes I've run: I will never grow past first-day-of-school jitters. This was the first week of lectures and laboratory sections for the introductory geology course I'm using as a testbed for active learning techniques. Bridge: Every lesson starts with an introduction ("bridge") to the topic and get things started. Participation: The meat of the lesson, where students actively participate and engage to learn and accomplish the objective. Post-test: Checking to see if the students actually learned anything. While this can be a direct mirror of the pre-test, it doesn't need to be that formal. So, what did it actually look like in practice? Each week I run two lecture classes, followed by two identical lab sections. Unfortunately, the times are inverted from how I'd ideally like for maximizing quality student interaction: long lectures and short labs. For the first week, we payed with rocks and contemplated scale. Lecture 1: This Is My Rock. I shall squeeze it, and pet it, and name it George... The purpose of our first lecture was for students to get familiar with rock types, understanding how and why rocks are classified. They did this through picking a rock (henceforth known as their rock, or possibly George) to use as their guide for the lecture. B: We used a Mingler icebreaker: I'd call out a characteristic (size, colour, texture...) and students self-sorted into groups based on how their rock fit that description. Once they were getting comfortable, I threw them a curveball: sort by rock type. Without context, they had to decide for themselves which rocks were most similar to each other. P1: This segued into a class discussion on how and why we classify rocks, working around to the question of how rocks form. P2: Time to set my students to work with a rock type jigsaw! Each group of 3 was given a handout on a rock type: igneous, sedimentary, or metamorphic. Once they'd digested the primary characteristics, the groups broke up. Students reformed new groups of 3, this time with one expert in each rock type responsible for teaching their peers. P3: Time to identify their own rock type! I did a bit of intervening to confirm or correct, then sent students off to peer-teach what they'd learned. We did one final round of Mingler, splitting into rock types so students could get a feel for how much variety existed within one rock. Bonus: Individual written rock descriptions. Each student was provided with a worksheet: the front had room for their name and space to write any description, sketch, or whatever else they found helpful. The back of the page was ignored for today, but had space for a rock identification number, a self-evaluation of the rock description, and a space to self-assign a grade. Students were warned they'd need to rely on these descriptions to identify their rocks on a later day. S: Collaborative rock cycle. Working as a whole class, we drew up a rock cycle, brainstorming how one rock type could become another rock type in different situations. Things that worked: Students grew attached to their rocks, developing a proprietary relationship. Considering non-geologists scoff about rocks being boring or all the same, I consider this affective objective a total victory. Things that didn't work: I miscounted the number of students, so didn't end up with the right distribution of rock-type experts and had to create some groups of 4-with-duplicates. In recycling the rock type handouts from an earlier year, I didn't catch they were overly technical for first-day students. But critically, I ran the class until the very last minute, failing to provide adequate time for cleanup. Thankfully, the professor of the next lecture was sympathetic and didn't mind delaying his class to allow me to pack my rocks in peace. Less fortunately, my idea of identifying which rock belonged to which student by taping paper with their name to the rock was slow, awkward, and difficult to return to the lab room intact. Verdict: Low-key but active first day, ideal for setting tone and accommodating inevitable stragglers without disruption. Would teach again. Improve logistics of rock/student identification storage. The second lecture was an exploration of scale: its importance, how to calculate it, and how to use it. The ultimate work-product was to produce instructions that will be peer-tested in a later laboratory. Things that worked: I was impressed that despite a few students over-thinking themselves into a complicated knot, no group got stuck while developing their instructions. Difficulties making real-life measurements match theoretical calculations are an excellent segue into sources of error. Things that didn't work: I managed to leave my slide deck at home, so I had to use the awesome photography project that inspired the quiz. Verdict: Nice concept, but students highly crunched for time. Shorten the bridging quiz to give the primary activities more breathing room. Lab 1: Where's My Rock Again? Remember kids, the only difference between science and screwing around is writing it down! After finding their rock and filling out the self-evaluation on the back of the page, we had a discussion on what aspects of their description were the most and least useful. This was our segue into discussing the importance of documentation in science, brainstorming its myriad purposes. Things that worked: Students were universally able to find their own rock, but less able to find someone else's. Despite my lingering doubts about trusting the collaborative process, students did an excellent job covering all the points I normally would've included in a lecture about how to observe rocks or why documentation is important in science. Things that didn't work: Setup took longer than anticipated (this is turning into a reoccurring refrain! ), leading to an awkward time-surplus at the end of class. Verdict: Cool concept, but execution needs improvement. The time elapsed between picking a rock and finding that same rock was short enough for students to rely exclusively on memory. Either allowing more time between writing and finding, or having students use each other's descriptions, would be more meaningful. 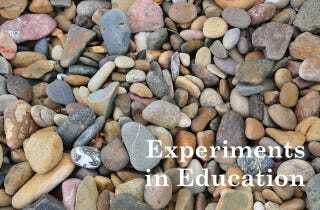 Experiments in Education is a weekly series documenting my experiences with bringing active learning into a university introduction to geology classroom. Check the first edition for the motivation of the series.